The Blue Orange is a bohemian club for music and art lovers. (They’ve been known to go on sailing expeditions too.) The gallery is curated by Ini Inaka, and I appreciate that they also have 3D installations. The current seventh month long exhibit opened last year around the end of August. There is likely about a little over a month left to view the huge collection of art; this post is about the Blue Orange Library. Sometimes the landing point is fixed to different places, but today I landed right in the library area. Sometimes, the landing is in a subway tunnel, and you’ll need to find your way down a hall, pass through the club area, and take a left into the Art Corner. You can catch a glimpse of the hallway leading to the club in the right of the photo above. I’ve lightened the exposure, and cropped these photos. There are chairs available to sit and read. But you’re likely to end up reading on the wall. 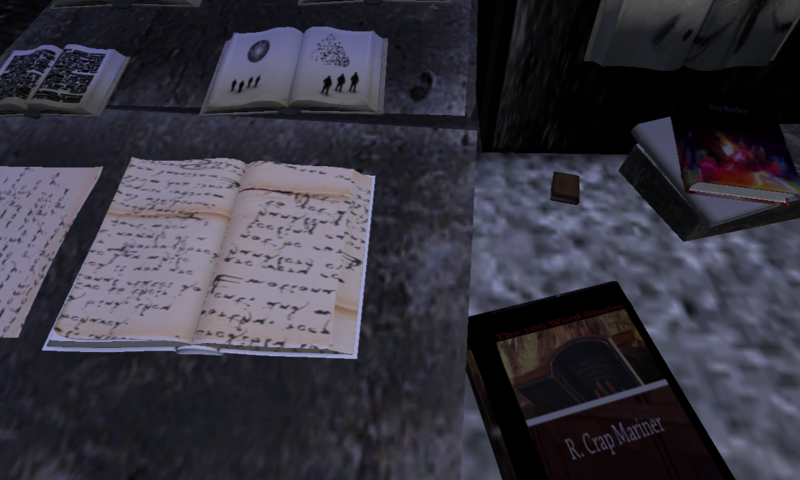 Many of the books are props, but click on some, and you will be led to some wondrous writings of SL avatars. “A bit of info about the library at Blue Orange. Armenian movie directed by Sergei Parajanov. Masterpiece! Artistic, unbelievable deep and unbelievable surreal, so visual and… and and and….!.. “Yes, main rule was to have own blog or website as a bit more of secure feeling when talk goes about copyrights. Each of the active books contains a notecard from the author, and a link to a website where the work is hosted. Just click on a book, accept the notecard and go to the webpage! Depending on your settings, you may see informational text when you hover you mouse pointer over active books. If not, click around and explore! 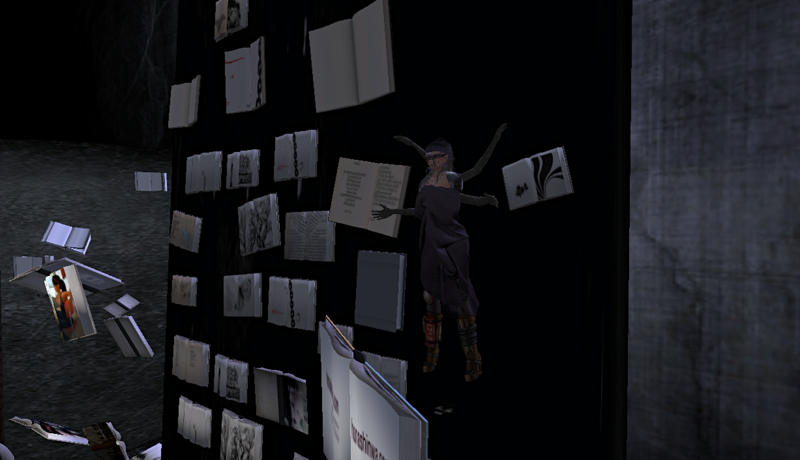 You’ll find active books floating in the air, as well as in the center section on the floor near the wall. So grab a cup of coffee or tea, and sit down and enjoy! There’s more info on Sergey Paradjanov and the film on the notecard. 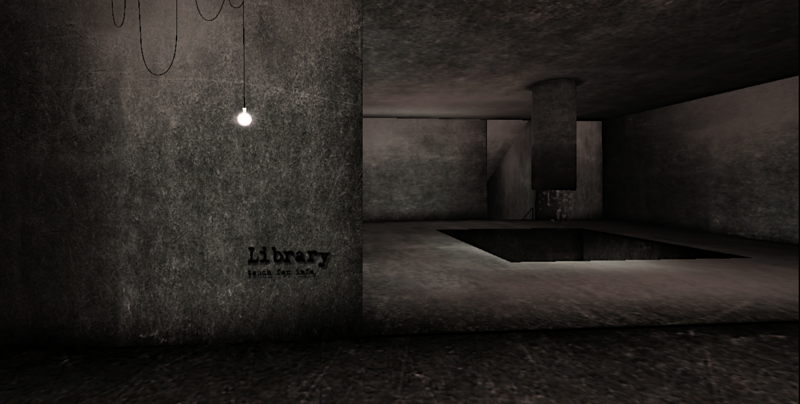 A copy is available by clicking on “Library” inworld, as shown in the second photo of this post. 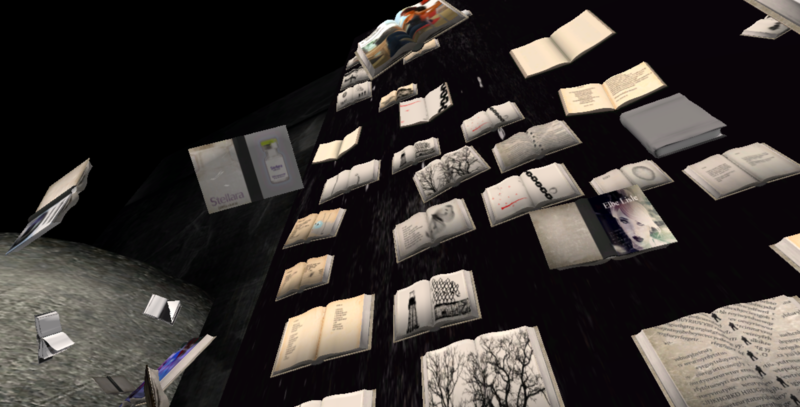 Ini was intrepid in approaching the sometimes insular world of writers in SL. Some of the participants are well known inworld, and had websites established. I was invited to participate because of something that was mentioned in my Picks: “clicking on the upright black journal on the typography shelf will give you The Coniston Letters, semi-fictional correspondence between the two friends and business partners at the Press. )” So, unread by Ini, I said yes, if I could invite my collab partner, Klaus. I hastily put together a blog, while Klaus was traveling with sporadic internet service. 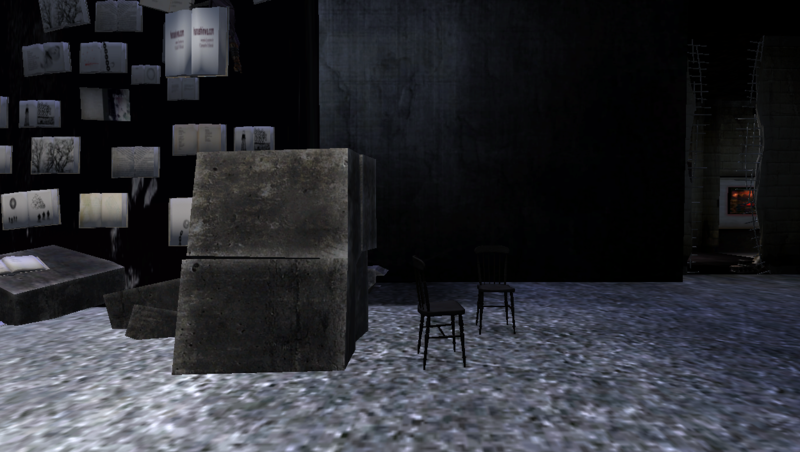 We have posted something once a week since, although some are previous works we’ve used elsewhere in SL. My intended point being, with the apathy that can be prevalent in Second Life, and the exclusivity in some places, it’s a joy for this avatar to see others creating opportunities and making room for creativity in our world. I invite you to visit The Blue Orange Library before it closes, and collect some websites and blog links for reading.